Are you looking for MSBTE 2018 Winter Examination Time Table? Do you want to know how to check MSBTE Winter Exam Time Table with different options, then read this article to know how to find MSBTE 2018 Winter Exams Time Table by paper code and also check our other articles which are about to get time table by Date/Course/Institutes Wise. MSBTE Winter Exams 2018 scheduled in November/December month. Students of MSBTE university appearing to this exam should download the time table, schedule of the Winter board examination of MSBTE university. 2. Confirm and Collect your Hall tickets. 3. Prepare your MSBTE Winter Exam properly. 4. Prepare your examination of Winter with previous year question papers. 5. Keep checking the MSBTE Winter Time Table for any updates such as postponed papers or know your exact exam time morning or afternoon session. MSBTE university always hold the Winter Exam during the year ending i.e. November/December months. The time table of MSBTE winter exam declares during September or October month i.e. before 1 or 2 months from the actual exam starts. This duration of Winter 2018 exams is 18 Working Days. There are four ways by which students of institutes can check Winter 2018 examination time table on the official website of MSBTE University. In this article, we are talking about how to find the MSBTE Board Winter examination 2018 time table Paper Code Wise on its official website. To find MSBTE board exams time table paper code wise, follow the given steps and you can get your paper code wise msbte time table for winter 2018 exam. 2. Find the Menu tab below the website logo head and move to "Examination" menu. 3. You will find many other sub menu under Examination tab. You have to click on "Winter 2018 Exam Final Time Table". 4. If you dont find this name or finding Tentative Time Table of Winter examination, then you have to wait for Final Time Table of MSBTE Winter examination. 5. Many times, MSBTE updates the time table, postponed the dates of few papers due to any reasons. So that, students of MSBTE must visit the official website time to time to check the exact date of your paper. 6. After you click on Winter Examination, you will be on new page where you can find Four sections or options which are about how to find your MSBTE time table by which method or type. 7. There are four types, so in this article we are guiding you how to find MSBTE time table by Paper Code. 8. 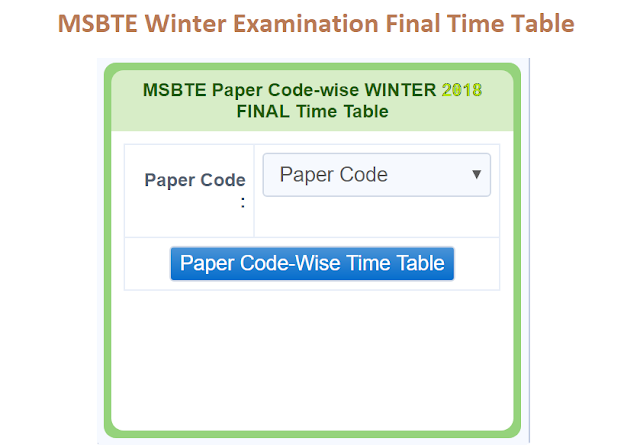 Find the "MSBTE Paper Code-wise WINTER 2018 FINAL Time Table" option and you can see there is drop down menu list where you have to select paper code and have to click on Paper Code Wise Time Table button. 9. If you do not know the Paper Code, then you may refer your guide book or syllabus book or ask your HOD - Head of the Department staffs, teachers, lecturers to know all the papers codes of your course. 10. On next page, you will find the Time, Subject Code, Subject Name, Scheme of your paper code. Note down all those details in your notebook properly without mistake or do not write roughly. Best option is to take print to avoid any written mistakes. 11. To find other paper code time table, just click on Click here to go back button and you will be redirect to previous option page where you can select the other paper code wise time table. 12. Repeat the process until you complete all your paper code time table. 13. Prepare your examination well and obtain well marks. If you have any query or want to know more about other options then click on relevant articles and read how you can find MSBTE time table by day wise, institutes wise, course wise. Post your queries about MSBTE Time Table or Results in Forum.